Three diplomats including Zambia’s High Commissioner to Kenya are receiving treatment at Machakos Level 5 Hospital after they were involved in a fatal road accident at Lukenya on the Nairobi-Mombasa Highway on the evening of Tuesday, February 26. The accident involved a trailer and two vehicles which were ferrying the envoys who were traveling from Maanzoni in Machakos county on their way back to Nairobi. 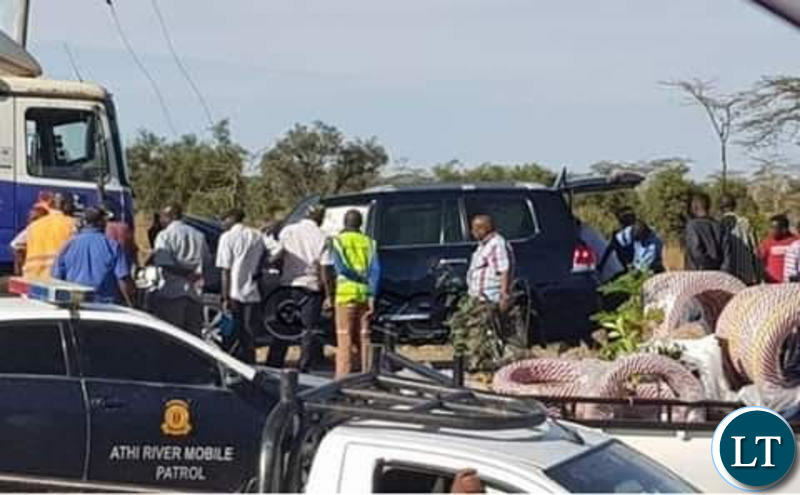 The vehicle that was ferrying Zambian Ambassador to Kenya Brenda Mudenda and her colleague Kama Wasa alongside their driver Joseph Guttu was reported to have collided head on with the trailer. Botwana Ambassador to Kenya Duke Lephoko and his driver Morris Maweu who were riding behind their Zambian colleagues also rammed into the trailer. Police reports indicated the convoy was led by a police vehicle with full Siren on and on reaching Lukenya bridge, the trailer that was coming from the opposite direction failed to give way. As a result a Toyota Prado that was ferrying the diplomat lost control and collided with the vehicle head on before the other one followed. Guttu sustained a fractured right leg and bruises on the left hand, Lephoko had injuries on the left leg above the knee while Mrs Muntemba complained of chest and abdominal pain. They were rushed to Machakos Level Five where they are currently receiving treatment. Both the truck driver and one of those who was driving the envoy escaped unhurt. The vehicles were extensively damaged. 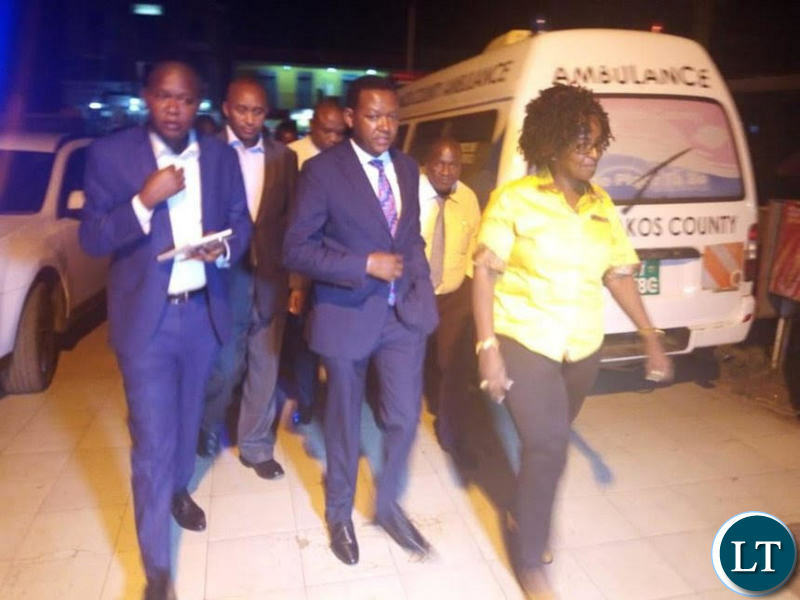 Machakos Governor Alfred Mutua arriving at the Machakos Level five hospital where the two diplomats are being treated. Fatal entails that someone died. Unfortunately, there is no mention of who died in the article. Perhaps the word was used wrongly in the above article, and hope this can be corrected Ba LT. It was the vehicles which were fatally damaged. Brenda is complaining of chest pains, she should be evacuated to South Africa, that’s ours with bruises go. And who is Mrs Mutenda? Does the writer mean Mudenda? Iam seeing “deadly”-which is just the same as fatal- has the headline been changed? Hahaha. Foooolish reporting. These LT journalists need to go back to school. “Fatal” and “deadly” means people DIED. And yet apparently this reporter doesn’t mention anywhere that anybody died. Mediocre reporting. LT, do you really have competent editors? Shame on you. So how is it a deadly accident when there was no loss of life?? Maybe it is because English is not my first language. Ba LT your reporting is not up to scratch!!! Hope our ambassador and the others get well soon..
How was the trailer moving? Is it Brenda “Mudenda” or Brenda “Muntemba”? There are 2 different names for one person in this report. LT Editor asleep on the Job as usual!! Ba LT, PLEASE WITHDRAW THIS ARTICLE AND HAVE IT REWRITTEN BEFORE YOU CONFUSE MORE PEOPLE!! The order of presentation of events, description of how the actual accident occurred are all in shambles; how can a trailer collide with a car head-on and then in other sentence say the on-coming vehicle collided with the car carrying Diplomats?? Kiki exactly my confusion. I stopped reading at this point. Hate to criticize someone’s grasp of their second language but are these guys at Lusaka Times a bunch of volunteers who rush out the door to look for a proper pay job? Seriously I’m curious, how is news blog run, who runs? Mistake surely is a one off rare thing, not this relentless malarkey that they continue to feed us on. Perhaps write in all 4 major Zambian languages, we will try to get it. They are like Fox News these LT guys. They scream sensation and they say something else. Ifyabupuba fye lyonse. Let me look for newsworthy sites I think mwe. Apa ungafelemo cabe na ma heart attack for nothing! I wish them all a very quick and thorough recovery. Mrs Muntemba/Mudenda complained of chest and abdominal pain, well, maybe Arap Moi knocked her up with a half Nubian Kalenjin bastador! You bet she is Munthemba because there is no way this tribalistically stinking PF government would appoint a Tonga called Mudenda as an ambassador anywhere. Anyway, we shall soon seccede with our Tonga cousins leaving you thieves alone. Wishing you all God’s blessings and please get better sooner. Fate does not choose but here in Zambia some leaders can design fate for sake of publicity. Wondering where politics is now taking us to. I was once nearly killed by presidential convoy. They drive so fast putting the public at risk ..I had to swerve into a Bush hitting a tree. They left me for dead there they didnt even bother to stop. anybody know why they were travelling this route (Mombasa to Nairobi) by road? I’ve been on this road, it’s the most dangerous road in kenya, not to mention long and very busy as there are so many trucks from the port. It`s HH who is behind this accident,he wants to use the Sesheke formula on our dear Brenda. Are you trying to read the news or correct mistakes. Fatal, Mudenda, Muntemba, ridding behind their Zambian colleagues! Waooooh. Our standards are really low. We need to do something about it. And Kambwili goes on ranting about an Indian man operating a compactor, my word. Get well soon High Commissioner Brenda, you are in our prayers. Get well soon for all involved in the accident.